This is a re-working of a book first published in 1977 about the phenomenology of UFO studies. 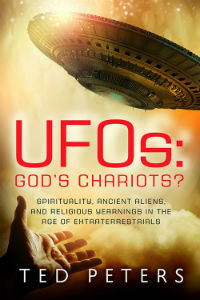 Ted Peters is a Christian theologian with a keen interest in the question of the reality of UFOs and how they are viewed and understood by the "UFO community". His general study of Ufology represents a "case study of the relationship between science and religion" (p13): He argues that "the UFO phenomenon exposes a widespread cultural tendency to translate traditional or spiritual sensibilities into scientific or materialist language and categories" (p13). He's interested not so much in an objective reality regarding the UFO question, as the interpretation of that reality within modern human culture - although he indicates that he thinks that there is some underlying reality to it (p14). His conclusions are often poignant and measured, although he does seem to become unreasonably aggravated by one element of Ufology - which I shall come to later. Ted Peters generally offers excellent analysis about Ufology, and is clearly well read around the subject. As with all authors, he leads the reader along paths of his choosing, and there is a strong bias towards a theological perspective throughout. I wondered whether these tendencies simply reflected his own pre-existing notions, borne out of his Christian beliefs - especially his propositions about E.T. saviours and celestial redemption. Was he simply pulling out cases which obviously pulled us in that direction, because they fulfilled his own cultural bias? As the book proceeded, and he tackled newer themes, like the post-1990s abduction phenomenon, it became clear that he was quite able to meet subject matter that did not corroborate his own set of memes head-on. This latter phenomenon, obviously not covered in his original 1977 work, creates a new, fourth category of classification of the UFO phenomenon named the Hybridizer, to stand alongside the first three: The Interstellar Diplomat, the Research Scientist and the Celestial Saviour. These categories become blurred at the edges at times, with some UFO cases falling into two or more camps. Nevertheless, his system of categories seem well thought out and reasonable. He argues that the problem with Ufology is that both the advocates of UFO reality and the sceptics both work from the perspective of an objective, materialist answer to the phenomenon, and neither side is capable of stepping outside the box to look within. In other words, their methodologies rely heavily upon accepted scientific doctrines (even if the opposing parties argue between themselves as to which side conducts the 'true' science). Although Ted Peters sets out this argument very clearly, and demonstrates the issue well, I was left wondering what the problem was. As far as I can see, many science-based researchers (both sceptics and 'believers') are quite capable of navigating complex, non-materialistic ideas to solve these kinds of issues. Cosmologists and other cutting-edge physicists, for instance, often enter into quite deep philosophy (sometimes even mysticism) to get to grips with there their maths is taking them. So, I'm not convinced that science is incapable of grappling with the more philosophical, even metaphysical, ramifications of the UFO phenomenon. The issue is the lack of concrete data upon which to hang a wild theory or two. Peters is on more solid ground when he tackles various aspects of UFO history and lore. He provides an excellent discussion about exopolitics, and the priorities of First Contact (pp54-5). He publishes a letter by one of the inventors of the MASER which debunks claims by Colonel Corso about the new technology's provenance (p73). He asks whether the U.S. Government's perceived power over the knowledge from the skies (and beyond) equates to a priest class, thereby projecting upon Washington a sacred identity to impress both its citizens and foreign agencies (p77). He then picks through a fairly complex argument about the evolutionary potential of extraterrestrial intelligence, quoting from several top biologists on the subject (p173). I became confused by the importance he attached to this scientific opinion, given his more general caution with the scientific mindset. But his points were nevertheless well made. From his perspective everyone else seemed to be falling into traps concerning the integration of myth and thus subjective bias into the scientific perspective. When reading through the final chapter setting out his own theologically-based thinking on the subject, one could only conclude that this was a case of the pot calling the kettle black. A glaring inconsistency emerged when one turned Peters' phenomenology onto his own thesis. It, after all, is also based upon myth, albeit one that he views as unquestionable Truth. Even though this argument also applies equally well to his own dogmatic perspective, that's not to say it's not true. I think there is definitely merit in Peters' assertion that Ufology meets a deep psychological need, one that used to be met by God (p207). That doesn't make it a competing religion however, just an alternative type of psychological crutch for those seeking solace in a confusing and harsh world. Equally, I was somewhat persuaded by his argument that the Hybridizer category of later abduction cases might well be a side-effect of an explosion of paranoia regarding child abuse in American culture around that time. At the moment, a similar scandal is gripping Western culture - beginning with Catholic priests, and now widening to historic child abuse which took place in many of society's key and hitherto trusted institutions. If Peters is right, then a new explosion of historic alien abduction cases should emerge, reflecting a paranoia about the evils visited upon a previous generation of children. So far, as far as I can tell, that hasn't happened. I found this book to be challenging to my own perspective and underlying set of assumptions about Ufology. It forces you to examine your own ideas in the light of common underlying mythological archetypes. Although inevitably perhaps, the author falls headlong into the same traps he points out to his readers, his study of the phenomenology of UFOs is worthy and, broadly, sensible. I would have liked to read what he makes of the Planet X Return controversy, and its underlying links to Christian Second-Coming/Apocalypse myth. Or perhaps, I wouldn't? Still, his overall thesis is pretty comprehensive and engaging, and I would recommend it to all deep thinkers concerned with the UFO question, especially those with orthodox religious sensibilities. Subtitled: "Spirituality, Ancient Aliens, and Religious yearnings in the Age of Extraterrestrials"